Not the sexiest set of hills these, but when I first did this walk back in the winter I was really quite impressed. 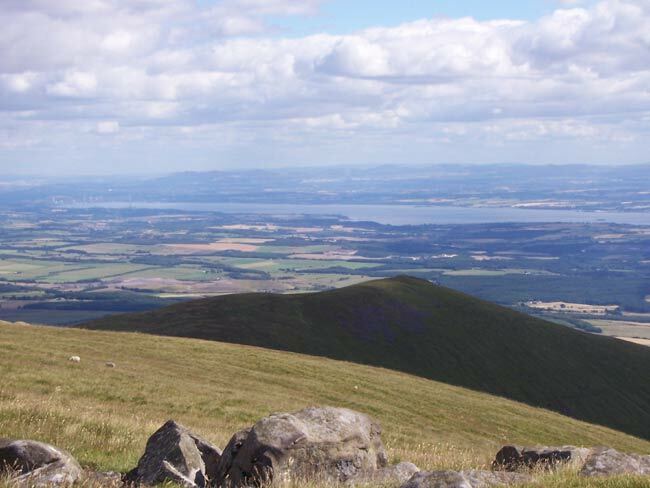 The Ochil Hills are situated just to the NE of Stirling and although relatively small they command a fine position and give excellent views in all directions. Irene, Malcolm and Carol joined us at the meeting point in the Country Park just outside Alva. In typical Salmon & Groves fashion the decision as to quite which route to take was left up to the last minute. 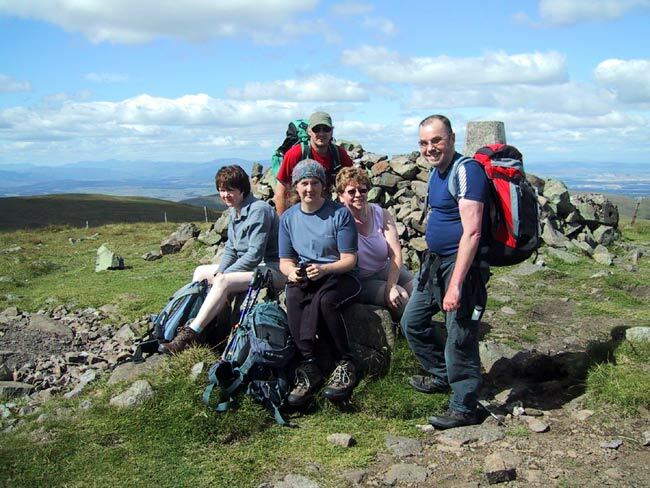 We decided to head up the Alva Glen and return down the Mill Glen, taking in Ben Buck, Ben Cleuch and The Law en route. it was going to be a very clear day. 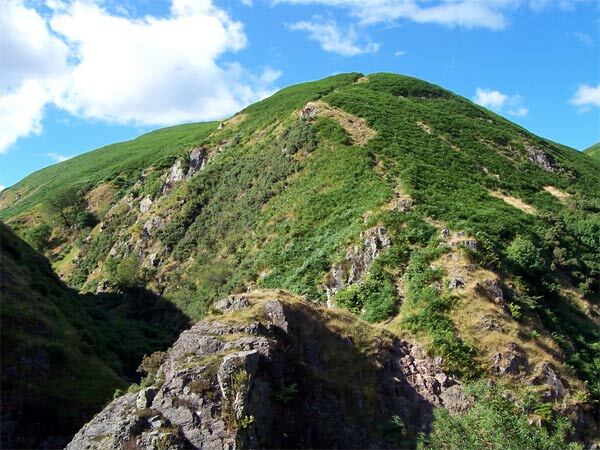 The Ochil Hills are around 500 - 700 m high and are almost completely covered with grass and heather, forming wild rough upland on their tops with very steep sided glens in between. 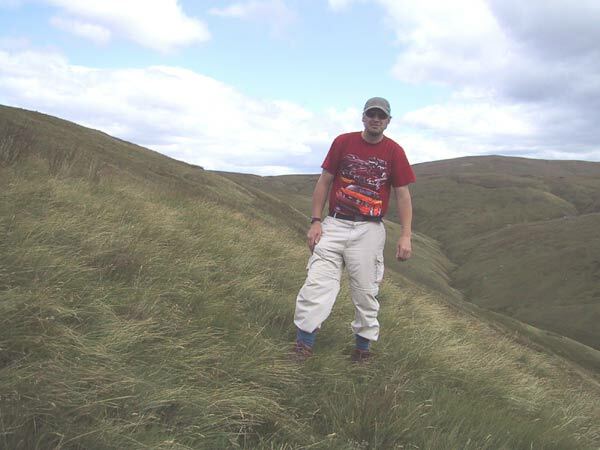 Our route took us along a broad path high on the side of the Alva Glen above its' narrow rocky gorge. It's quite a tromp to the end of the glen where the path petered out and the only really steep part of the walk started. 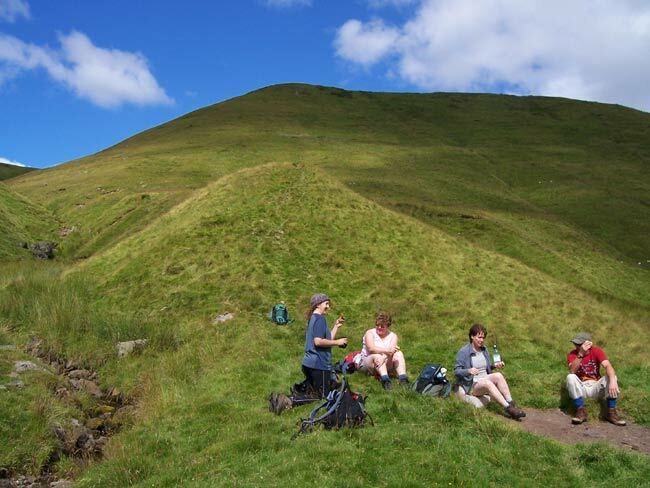 With everyone looking at the steep climb ahead and reminding me that I'd described the day as 'an easy hill walk', we decided to take a lunch break. Somewhere around this point both Irene and Carol decided to go 'legless' and the rest of us put our dark glasses on. The climb up the side of Blairdenon Hill wasn't as bad as it looked (really) and when it got too bad the view behind down the Alva Glen to the Forth was well worth a look.
. If he disappeared into a quagmire at least we'd know not to go that way. Once on Ben Buck the going was easy again and the stroll over to Ben Cleuch should have been straight forward. Then there was a loud thud and when we looked back, Carol was in a crumpled heap on the ground! Thankfully nothing was too damaged and we were on our way again. At the summit we stopped to take in the views and met a local chap who pointed out every bridge, hill, river and glen around; which was rather good seeing most of us weren't used to these eastern parts and hadn't a clue about what we were looking at. The descent down The Law was easy and Irene (with a second or possibly third wind) raced off and was soon a dim blur in the distance! 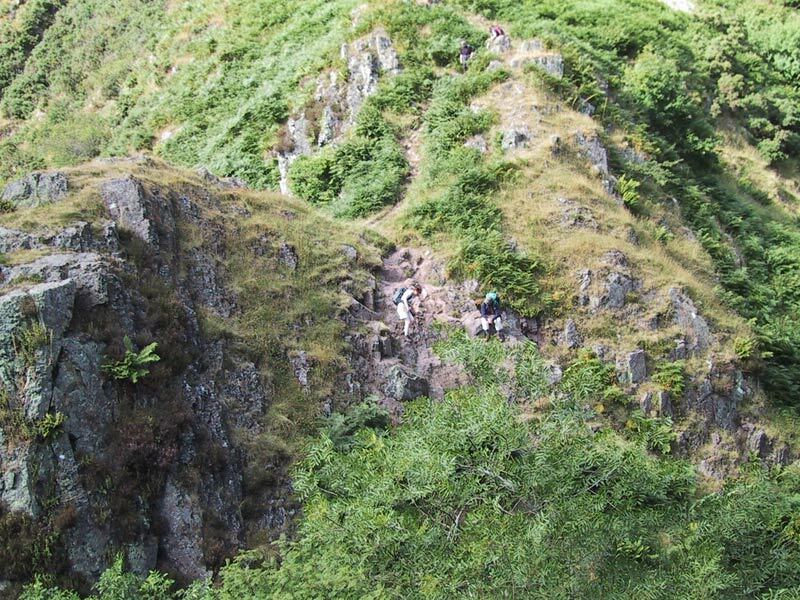 The final few metres into the Mill Glen were steep and a bit rocky, but very impressive. I was a little slow (understatement) and by the time we met up with the others, Carol was asleep on a bench! All that remained was the walk down the gorge and a final rather hot trudge back to the start point. A pint in one of the nearby villages was needed.